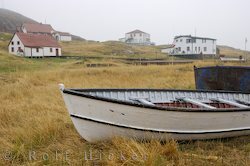 An island destination steeped in history, Battle Harbour in Southern Labrador will take you back in time, the minute you step off the boat. Battle Habour is about as far from Disney Land as you can get. Nothing here is contrived, fake, or kitschy. Any day in Battle Harbour is a good day to be alive. Spectacular scenery aside, Northern hospitality will delight you, wildlife will surprise you, and the meticulously restored buildings will take you back to a time when people lived by the seasons and got up with the sun. 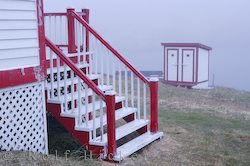 The Battle Harbour Historic Trust took the island under its wing in 1990, and 17 years later, the island is a haven for anyone seeking a quiet refuge that truly is away from it all. Battle Island tickle was once the busiest port of call after St. John's, on what is now Canada's East coast. 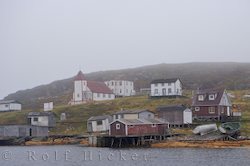 Most fishing schooners heading North would stop in or at least sail close by the sheltered tickle off the coast of Labrador. 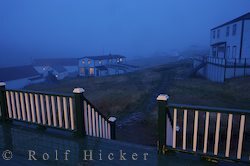 In it's heyday, the town of Battle Harbour had a permanent population of 300, and a seasonal crowd of 1000. The island itself is just half a mile long and a quarter-mile wide. Very small for such a busy port and it was once known as the Capital of Labrador. The tickle was not just a lay-up for weather-bound fishing vessels. In season Battle Harbour was an important fish-processing site. The precious cod taken from Northern waters would be brought ashore in Battle Harbour to be cleaned, split, salted, and dried before being shipped the world over. Today, Battle Harbour is the only place where original fishing rooms remain largely unchanged since the 1800s. 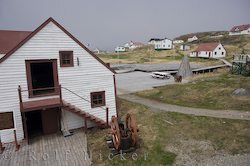 In fact, until the Canadian federal government issued a moratorium on inshore cod fishery in 1992, the original salt stores and other buildings here were used to cure fish for global markets. The buildings (some dating as far back as 1775) never had a chance to fall into disrepair, and salt from two centuries of drying fish has done its part to preserve the hand-kneeled timber. For such a tiny island, Battle Harbour has seen its share of history in the making. Merchants doled out supplies to settlers in exchange for salted fish for hundreds of years. Dr. Wilfred Grenfell established Labrador's very first hospital on the island in 1893. A Marconi station in later years was an important relay in linking this small out port to the rest of the world. (It was from here that Robert E. Pearey announced to the world that he had gained the North Pole - a claim still disputed today). 1967 saw the town almost slip away as families were resettled to nearby Mary's Harbour as part of the government's resettlement program intended to localize services in larger centers, but folks were too attached to the place they called home to stay away. The island weathered the years, and the people survived the mood swings of merchants and governments alike. Lucky for the rest of us, Battle Harbour lives on today. In summertime, Battle Harbour is as busy as it ever was. Many locals still call the island home for the summer months, living in family dwellings that cling to the rocks after decades of weather, and the Battle Harbour Historic Trust now takes care of the rest. Restored buildings, wharves, fish-flakes, and walking paths adorn the island now, as they did centuries ago. Preserved perfectly as it is, there are no cars on Battle Island (though electricity, flush toilets, and running water are all commonplace these days). Most visitors to the National Historic District take the hour-long passenger ferry from Mary's Harbour, leaving behind all things wireless and those on four wheels. Others find their own way there. Battle Harbour is still a haven for sailboats and yachts, and you never know who will be dropping anchor in the tickle that day. Any visit to the island should start with a guided tour of the properties. You'll learn about the history of the island as well as the Trust's work in maintaining the site. You'll cross thresholds to another time as you step inside the salt store where the beams are damp with the moisture of two centuries of salt. Climb the stairs to the very warehouse where Mr. Peary held a press conference on his visit to the North Pole, and learn about the backbreaking work involved in salting and drying hundreds of pounds of codfish to keep your family in food for the winter. And this all on the merchant premises alone! The rest of the island is not short on historic treasures. A visit to the church of St. James the Apostle is a visit to Labrador's oldest Anglican Church, and the Newfoundland Rangers Detachment is a rare peek at the law enforcement that patrolled Newfoundland and Labrador for just 5 years before the province became part of Canada in 1949. The cemeteries shed light on people who toiled the Northern land years ago. On back of the island, see the remnants of a 1966 plane crash and hear the story behind it all. Come for the history lessons but stay for the accommodation. The Trust maintains bed and breakfast style rooms in 5 historic buildings and rents hostel style bunks in the Cookhouse. All have kitchens to prepare your own meals, or join other guests of the island in the dining room for delicious home-cooked meals. You can rent a private cottage and watch the sun rise and set in a brilliant display of colour, or even pitch a tent- the famous Labrador black flies are blown away by the constant ocean breeze, so you won't be bothered by buzzing in the night. Soon you'll be rising with the sun to make the most of your time on Battle Island. This is one trip where you'll want to leave your cell phone behind. Guests should take the opportunity during their visit to this remote part of the world to explore some of the surrounding islands. 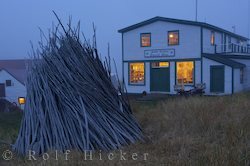 Just across the tickle lies Great Caribou Island. 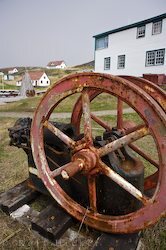 Here is the source of all fresh water to Battle Harbour, and home to many former fishing communities, each with a history as captivating as that of Battle Harbour. There are boat tours available to circumnavigate Great Caribou Island, which costs around $125 per hour for the boat transport and guide. Like the fishermen of days gone by, no money will change hands on Battle Island, at least not until you are ready to go. You settle your tab at the general store before boarding the ferry to take you back to the reality of cars and alarm clocks. For more information on accommodation rates and reservations, visit the Battle Harbour website. 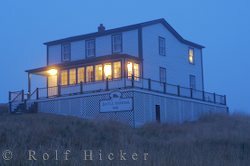 As well as catering to independent travellers, Battle Harbour is also a unique destination to hold a conference, and/or workshops. A round trip on the ferry (M/V Iceberg Hunter) costs $50.00 per adult and $25.00 per child (as of August 2007), it's a one hour journey each way which departs from Mary's Harbour twice daily during the summer.